This map shows the cumulative calls for help compiled by the Harvey Relief and Harvey Rescue volunteer groups, which has gathered information from social media and through Google Forms. Many of these people have since been rescued. Hurricane Harvey doused Houston with record-setting rainfall and flooding, bringing the nation shocking social media posts of people stranded and desperate for rescue. Nowhere in the city did those cries for help on Twitter and Facebook seem more pronounced than its northeast corridor extending from Lake Houston and the San Jacinto River to nearly the city’s center. “Someone send a boat our way 3 kids and 7 adults. 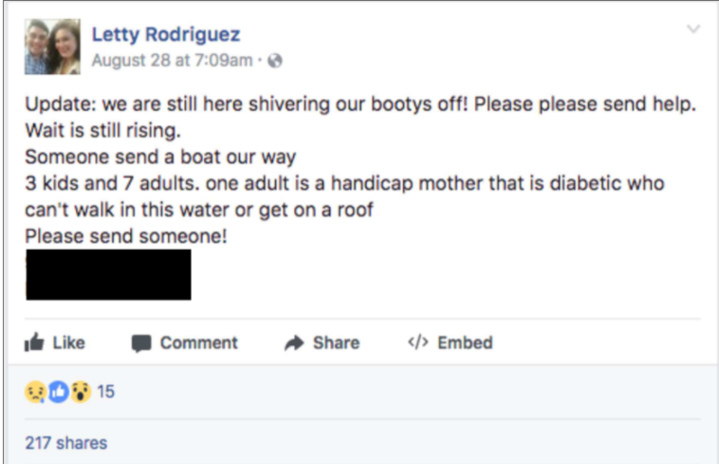 one adult is a handicap mother that is diabetic who can’t walk in this water or get on a roof Please send someone!” Leticia Rodriguez, who lives in East Houston, posted on Facebook during threatening floodwaters. BuzzFeed News crunched data compiled by a group of coders and organizers — some members of the #AltGov movement, one a Snopes employee, and some former government officials who worked on Katrina relief — known as @harveyrescue and Harvey Relief. They are compiling and mapping rescue requests from social media and entering them directly on a spreadsheet being circulated on social media. And while every post hasn’t been verified, and the list of posts isn’t definitive and is consistently evolving, it appears as though the highest concentration of distress calls came from three ZIP codes — 77044, 77049, 77078. The neighborhoods are largely black or Latino with relatively low incomes. BuzzFeed News spoke to nearly 30 people in those those three ZIP codes and two neighboring ZIP codes that saw a high volume of social media posts, offering a glimpse into how people used social media as they grappled with the devastation Harvey left behind. Many people reported that 911 calls were not going through to operators, and according to the Federal Communications Commission, 16 of the area’s 911 call centers were having problems dealing with the deluge of calls. Houston officials pleaded with people to call 911 and hold the line if they needed rescue. But, unwilling to waste phone battery on call waiting, people or their friends and family members posted their location and details of their situation, replied to government accounts posting official information, and pleaded for help after waiting for hours with no food, no water, and without important medications. It seems most of the people have since been rescued. The footage of people desperate for rescue evoked Hurricane Katrina in 2005. 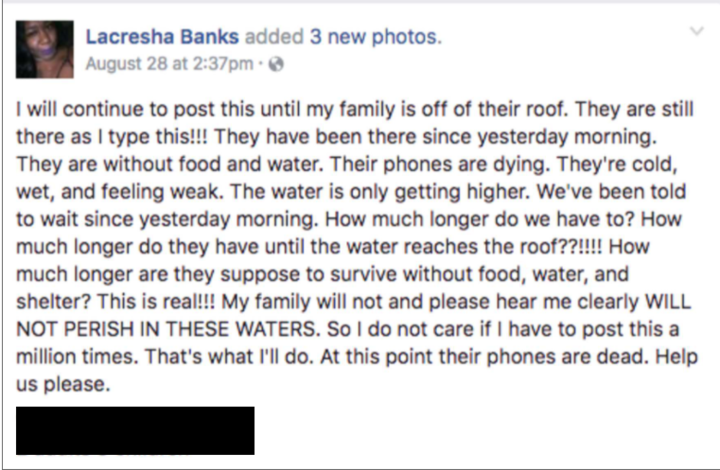 But unlike today, smartphones didn’t exist during Katrina. Twitter hadn’t been invented yet. And Facebook was still reserved for college students. Reyna said he expects to see a jump in casualties, especially the elderly, sick, and people with disabilities. “There was a cancer patient on support that lost power in the neighborhood, and I just couldn't get to him at that moment,” he said. Reyna has been going live on Facebook sharing where he is — and people commented and tagged others who need help. The East Houston neighborhood — zip code 77078 — is 62.3% black and 32.6% is Hispanic or Latino of any race, according to Census data from 2015. More than 92% of the area’s population has not finished college and more than 60% of individuals makes less than $35,000 a year. In the 77049 zip code, which includes parts of Channelview and sections of Sheldon, has a population of 31,111. Approximately 60% is Hispanic or Latino of any race and about 24% is black. The median individual income is about $26,500. The 77044 area which includes Summerwood has a population of 37,753 with 45% being Hispanic or Latino of any race and 26% black. The median individual income is $38,225. Rodriguez, 25, who ended up being rescued by a civilian, told BuzzFeed News she never saw authorities in her East Houston neighborhood. “I don’t think they took us seriously,” Rodriguez said of officials. 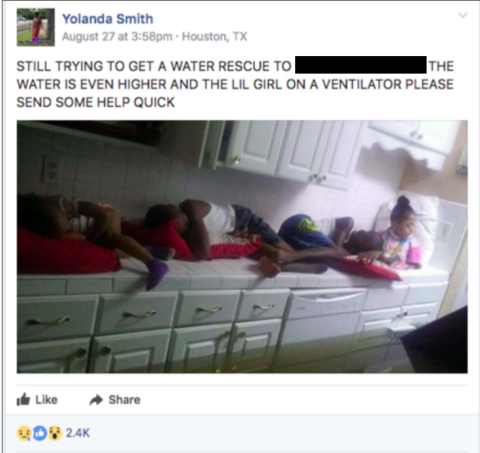 Yolanda Jackson, 45, said she was waiting on the roof of her house with her husband and three children for almost 24 hours before she was rescued by a volunteer — who told her he saw a screenshot on Reddit of a Facebook post Jackson’s friend posted with her address. “We were out of food. Dehydrated. It was raining, and windy, and cold,” she told BuzzFeed News. Several of the people BuzzFeed News spoke to recounted escaping their homes submerged in neck-high waters, and walking miles in trash-filled floodwater that public experts say carries harmful chemicals and bacteria that could spread infections. At about 4:30 a.m. on Sunday, Moore, 49, stepped out of her bed into ankle-high, muddy, murky water and immediately called the Coast Guard. Moore had four children in her care and moved them on top of the kitchen counter, out of the rising water’s reach. She took a photo of the children, which quickly went viral. Moore recounted loading the two young boys into plastic laundry containers and the two girls in a long trash-can-type container, and wading into the water, walking against the current. Half-swimming, half-walking through water containing bugs, garbage, and fast-moving trash cans swept up from people’s yards, the Moores reached their neighbor’s house, where the water inside was chest-high on the first floor. Some men there had a raft to help get people up the stairs, which had broken under the water’s weight. Her family was rescued by a Coast Guard helicopter at 5 p.m. that day. If it weren’t for the pressure of her viral photos, she thinks it would have taken much longer.